I ordered Brett’s father’s day gift and it arrived last night via FedEx. Props to my cousin who works for the carrier, I was rather impressed on the speed of your delivery service. 5-8 business days was 2 day shipping. SCORE. Next time I need to deliver a vital organ I know what carrier I’m choosing. Anyways, I opened the box just to check and make sure that the item I ordered was correct and not damaged. Cause that’s never happened to me before. Insert sarcastic tone here. Since Brett is a snoop, and I refuse to tell him what I purchased…I won’t even tell you Internet….GASP….I had to get creative on on boobytrapping the box. 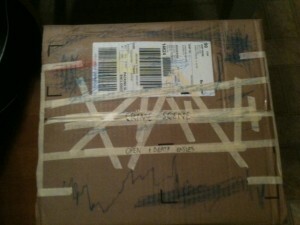 You will note that the way in which I have taped the box is done so that brett cannot open said item without me actually noting he has done so. I’ve also reinforced my tape with writing so that, just incase he breaks the seal he would have to then recreate my lovely chicken scrawls. Nearly impossible. Cardin wanted to help me decorate the box so I let her get her crayons and go for it. You can see in the lower left hand corner there is almost an earthquake like effect with her artistic skills. VERY MOVING. I’m thinking that I might not even wrap his gift up. This may be wrapping enough. Happy Fathers Day!